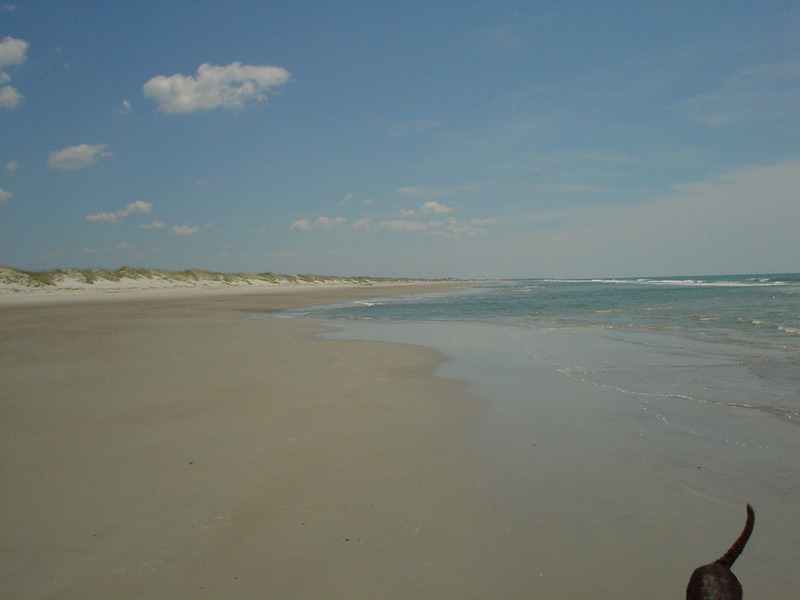 When we come to Emerald Isle, we often take the boat to the east end of Bear Island (Hammock’s Beach State Park) [if you follow the link, the “pinpoint” is at the mainland terminus for the passenger ferry, the park is on “Bear Island” in the center of the map]. However, today we decided to take the boat and go to Bear Inlet on the west end of the park. While I’ve walked to the west end before, it had been years. The beach at the park is beautiful, and it was nice day (note that artistically inserted dog tail in the lower right of the picture 😉 ). We went about 1.5 hours before low tide, and I was a bit concerned about the water levels in the passage to the inlet (it’s not marked nor dredged). However, as I was turning into the cut, another boat, bigger than mine, lead the way in running at a full plane. So, I revved up my motor and followed, though the depth finder was showing only about 3 feet in several areas. I followed his wake trail, and got there without any problems. We pulled up along side the “back channel” that runs on the north side of Bear Island and dropped anchor along side the 3 or 4 other boats there. Here’re Jason enjoying a swim in the current in the channel. We walked close to two miles back toward the park facilities (the only development on the island) and met my mom & sister, who’d taken the passenger ferry to the park (the only way to the park is by boat, either the park ferry or private boat). Walked back to the inlet and hung out for a while, swimming and collecting shells; mom & sister walked back to catch the 2:30PM ferry, and we left close to dead low tide, though some water was still flowing out the inlet. I took it pretty slow headed back to the ICW (Inter Coastal Waterway), fast enough to pick up the back end of the boat, but not so fast as to hurt the lower unit if I hit a sandbar. Touched bottom once, but that was it. Lessa the lab took that opportunity, though, to jump out of the boat, so we had to toss out the anchor, jump out and toss her back in. 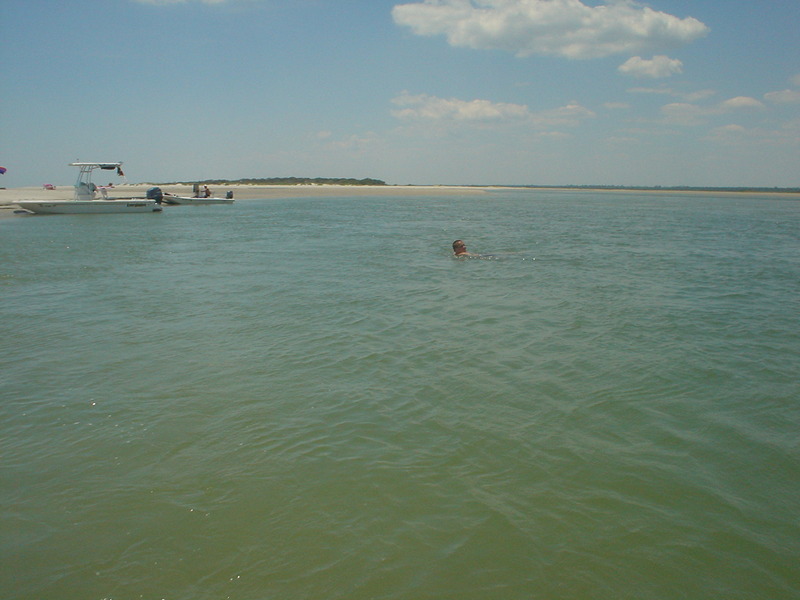 We decided that Bear Inlet was a great trip, less crowded than Bogue Inlet, and worth a return. Maybe later this week! This entry was posted in Boating, Family on July 2, 2008 by joel.